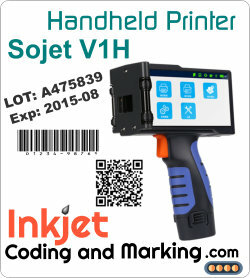 Handheld Printer solutions for Packaging Industry The Reiner JetStamp is a recognized brand of Inkjet Coder and offers Date Coding and Lot Code Marking directly on Cardboard Boxes, Plastic Package pouches, Metal Tins and Glass Bottles. Packaging Machinery Automation got you down…Do It by Hand. - Practical and Affordable, a Handheld Printer can be utilized as the main marking tool for packagers or when packaging automation lines are down, the Handheld Printer comes to the rescue as a backup to automated Coding and Marking printing systems. The model JetStamp 790MP Handheld Printer Reiner JetStamp 790MP offers Easy Date Code and Lot Code Printing directly onto virtually any packaging substrate. Configure either One Line or Two Line Imprints, with a fixed text height at a 1/8 inch tall font. Black Ink or optional Yellow Inkjet Inks are available. The Reiner JetStamp Grapc 970 Handheld Printer can print Date Code and Lot Code Printing directly onto virtually any packaging substrate. Also Print Product Graphics, Barcodes that can be read by a scanner. Configure either One Line or Two Line (up to approx. 4 lines) Imprints, with a maximum Print Height of 0.50 inch tall. Black Ink for Porous or Non-Porous Surfaces are available. 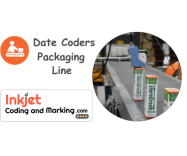 Date Coding Inks that perform and adhere onto both porous and non-porous substrates! Choose from Black Ink or Yellow Ink for the Reiner JetStamp 790MP Inkjet Coder. The Reiner JetStamp Handheld Printer has many applications in the packaging industry. We are Serious about Your Success. Partner with Us, we specialize in the Handheld Printer for Packaging Industry, we have you covered for System Design, Rollout Training and after the sale, with Service and Supplies, that are In Stock…supporting businesses Since 1962. Click to Shop the Handheld Printer JetStamp from Reiner. Discover Contract Packaging and Co-Packing Industry essential technology products for printing and labeling. 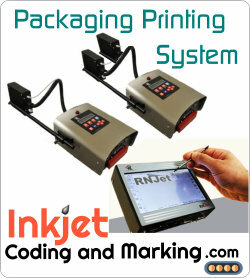 Printing Packaging Corrugated Boxes with High Resolution Inkjet Printer, Date Coding Printers and the Handheld Printer. 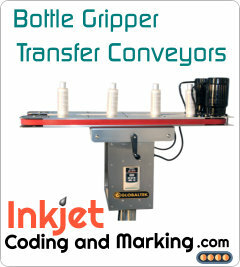 The Globaltek 37S Bottomless Hugger Belt Conveyor can be deployed as a Bottom Coder for CIJ Printers, or a Gap Transfer Conveyor with adjustable Bottle Grippers for any packaging line.